Feed premix are a mix of certain complex compounds such as minerals, vitamins, and amino acids. Two or more number of these compounds should be present in the feed premix. These feed premix give animals a direct source of nutrients, and help give them proper nourishment. There are certain nutrient compounds such as macronutrients and micronutrients in feed premix. Macronutrients are nutrients that are required in large quantities by the body, such as carbohydrates and fats. Micronutrients are certain nutrients that are required in small quantities by the body, such as vitamins, minerals, and amino acids. These micronutrients are mostly not found in animal feed. Hence, consumers have started feeding animals with feed premix that consist of all the micronutrients in large quantities. This helps the animals get proper nourishment. Feed premix are added to animal feed for their consumption. The main objective behind feed premix is to deliver micro ingredients in a desired manner. The premixing manufacturing process is of two types; one is the simple hand mixing of various ingredients such as vitamins, minerals, and other trace elements. The other type of premixing is mechanical mixing. The manufacturing process of feed premix comprises the selection and procurement of raw materials such as corn and soy. Storage and sampling analysis of feed premix is done, and then processing is carried out. The second step includes the formulation of feed premix. In this step, the desired form can be obtained. Weighing and mixing of the ingredients are done in this step. The last step includes the packaging, labelling, and storage of the finished feed premix. The report includes the detailed manufacturing process of feed premix, which includes the procurement and the selection of raw materials, storage of the raw materials, analysis and sampling of feed premix, processing of feed premix, which includes two other processes such as milling and sieving. 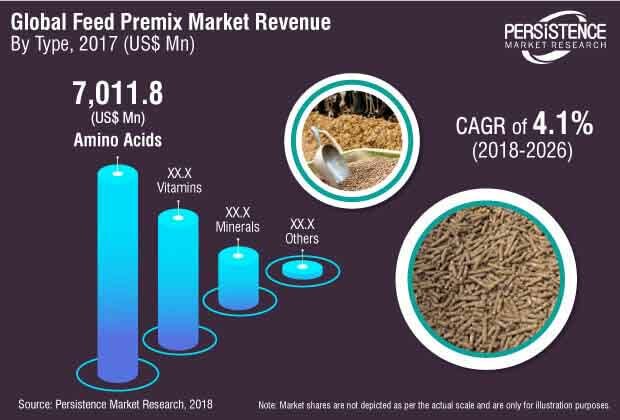 Formulation is a critical step in the manufacturing of feed premix, as it has to meet certain requirements such as physical and chemical characteristics. The physical characteristics of feed premix are compressibility, flow ability, particle density, particle shape, and size. The chemical characteristics of feed premix are purity, pH, potency, stability, and reactivity. Weighing and mixing of feed premix is the next step in the manufacturing process. There are certain chemical carriers added to feed premix, such as organic feed premix carriers and inorganic feed premix carriers. Organic feed premix carriers consists of lactose, soybean meals, rice hulls, wheat middling, corn cobb, and ground. Inorganic feed premix carriers include fine dried salt, dicalcium phosphate, calcium carbonate, monocalcium phosphate, and zeolite. The mixing includes micro mixing and macro mixing techniques. During the macro mixing technique, there are certain parameters to be considered while mixing the feed premix, such as type of the mixer that is used, mixing order of the feed premix, and the mixing time of the feed premix. The final step in the manufacturing of feed premix includes the packaging, labelling, and storage of feed premix. Storing temperature and humidity of the warehouse should be taken care of. After these, there are three quality control methods to be followed, such as quality control steps for raw materials, for the production process, and for the finished feed premix. There are various processes during the course of quality control, such as flushing, sequencing, and the mixer cleanout procedure. Vitamins are certain organic compounds and a type of macronutrient that is needed in small quantities by animals in order to sustain life. There are various types of vitamins available, such as vitamin A, vitamin C, vitamin D, vitamin E, vitamin K, and the types of vitamin B. Vitamins are consumed as food, and are not naturally processed inside the body, which helps drive the feed premix market. Minerals are certain chemical elements that are required by animals to perform various functions that are necessary for life. Minerals naturally originate from the earth, and are not secreted in the body. Hence, minerals should be consumed through food and water. Most minerals are obtained by eating plants and drinking water. There are various types of minerals such as iron, sulfur, cobalt, zinc, copper, iodine, selenium, and others. These minerals are used in animal feed premix. Amino acids are the derivatives of proteins. It is always said that all proteins are amino acids but not all amino acids are proteins. So, the consumption of more proteins will lead to gain more amino acids in the body. But there are certain amino acids that cannot be found naturally in the body. As such, there should be an external supply of these amino acids. Hence, amino acids, along with vitamins and minerals are added to feed premix. LOTUS MINECHEM RESOURCES PVT. LTD.
Titan Pharma (India) Pvt Ltd.
Shenzhen Jinxinnong Technology Co., Ltd.